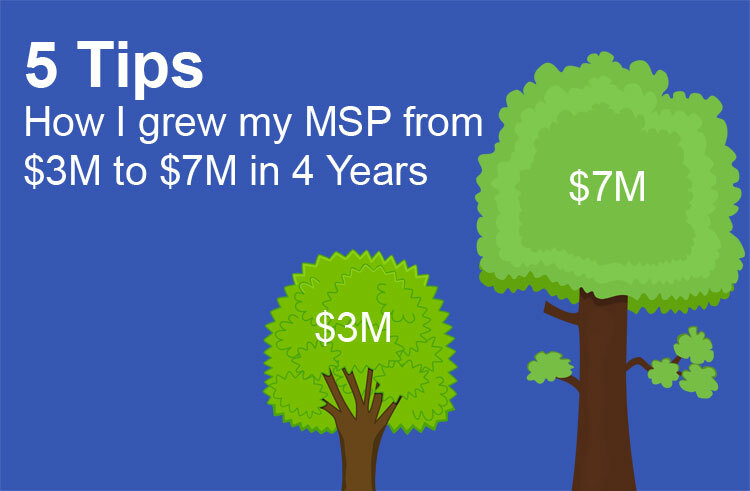 If it’s not already obvious growing an MSP is hard work. In today’s article I’ll tell you how we grew from $3M to $7M in 4 years selling to Small to Medium Businesses (SMBs) without increasing our leads. Let’s look at the statistics provided by our good friends at AutoTask and ConnectWise. Did you know that 80% of MSPs manage under 2500 desktops and laptops? Did you know that 63% manage under 1000 desktops and laptops? That’s means virtually the entire MSP market globally is represented as a small business with the vast majorities revenue ranging from probably $500,000 to $3,000,000. We’re selling relationships NOT products. Relationships are hard to scale because believe it not people like to be comfortable so they don’t change partners regularly. That’s a great thing for reducing ‘churn‘ but makes it harder to sign up clients like clockwork. In 17 years I’ve never convinced anyone to change to our services if they’re already happy. Most MSPs owners are focused in the business not on the business. This is because of the size of the business, unless you’re out of the day to day, it’s very hard to focus 100% of your time on growth. Most MSPs don’t have an efficient sales engine. That comes down once again to not having dedicated resources focusing 100% of the time on sales. There’s many other reasons which relate to the size of the city you’re in and the types of clients you’re targeting but once again what ever the reason the statistics prove it’s hard to scale an MSP in the SMB market. The good news is you don’t need more leads. You need leads, don’t get me wrong, but we didn’t grow because of increasing leads. Here are my 5 tips explaining how we grew from $3M to $7M in revenue in 4 years. We weren’t focusing 100% of the time on signing up new clients because I was doing the new business selling. I always thought that we didn’t have enough leads to justify someone in this role, but then I was told some important advice by a business coach. If you’re the business owner signing up new clients or doing sales then you’re resigning the sales function in your business to a ‘part time’ role, which gives you ‘part time results’. Ouch, I realized they were right. On top of this we weren’t focusing 100% of the time on consulting and client roadmaps which resulted in ‘network upgrades’ sales. The big sales items for most MSPs. Before you say I tried that, let me explain. Most people misunderstand this persons role. They think they are going to be a rainmaker and bring in all this business. We all know that isn’t reality. What we did was realize a couple of things. The most important point we realized is that ‘the business’ itself should generate the leads and a Sales Manager should be the person to convert them! So referrals, google Adwords, direct marketing campaigns etc etc. You need to find someone who is going to reflect the type of client you want to sign up. If you want larger clients who typically wear suits such as lawyers, accountants or other corporates, then hire someone who has experience, who exudes ‘trust’ and has sold to this market before (doesn’t have to be managed services). Remember we’re selling relationships! Your sales manager needs to be someone they trust and feel comfortable having a relationship with. When the CEO is the main sales person it makes your business look very small. Nothing beats ‘layers’ when your selling. Nothing beats a Sales Manager being able to escalate to a CEO as a leverage strategy. He needed to do 2 roles; New Business AND Solution Selling. So we found the right person with B2B sales experience , he came from Fuji Xerox, but young enough to be excited about helping build a company. We gave him a clear KPI around how much MRR he needed to sign up per year and how much solutions he need to sell based on the pipeline we knew we had. Man I wish I had done this sooner. You have to sell options for your ‘managed support’ AND your ‘network upgrades’. Read this book Monetizing Innovation and learn about the importance of having options and anchor pricing. You want people engaged ‘choosing’ an option rather than being sold one thing where all they can do is say yes or no. If you increase your sales conversion of new support deals, you grow. It’s that simple. The problem with giving one option is that the client has no other choice but to go to market to seek other options. Worse if you give one option for a network upgrade to an existing client you can not only lose that deal you can lose the client. This happened to me twice until we changed our approach. So we realized we had a huge untapped potential revenue for network upgrades and we weren’t focusing 100% of the time on finding new clients. So we hired a great Sales Manager with experience selling B2B, and he started signing up more clients AND bigger clients. But in Point 2 we mentioned the Sales Manager needed to focus on new business AND solution selling. We realized if we actually sold the network upgrades faster in a shorter period of time, that would probably increase our revenue in any given fiscal year. We were right. Our Sales Manager farmed our clients like never before. From the clients perspective he was providing roadmaps and proactive advisory, but the net result was we sold more deals – much much faster. Revenue increased year on year as we focused on getting new clients AND farming the old ones and the new ones. I’ve already written about this here, but the fact is you need to stand out in the crowd to differentiate your services. You need to give your Sales Manager ‘ammunition’ to win new business deals in a very competitive market place. Differentiating ourselves was part of the reason that we invented ITSupportPanel and all I can say is it absolutely works as a sales tool to stand out in the crowd. 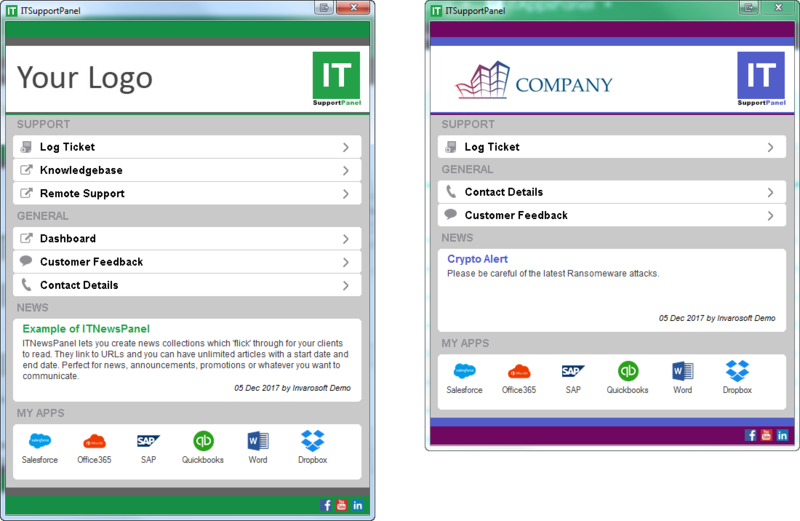 Being able to give a client an app they can use for IT Support is different from other MSPs. We became memorable. We offered more value! There is no doubt in my mind our growth came from being better at selling this innovation as part of our sales mix. The reality is you do need a bit of luck. If you sign up a large client who spends a fortune upgrading infrastructure and buying PC’s, then it obviously makes a difference. But I think you draw that luck towards you by doing the tips I mentioned above. One of the big things we’ve done every year is to run what we call a Dell or HP Campaign (we do it with Dell). We tell our clients that for 3 months of the year we’ve worked with Dell to get group buying discounts on their products. We create a ‘good, better, best’ campaign with 3 options of desktops and laptops. We save the client a fortune over RRP and make a huge margin ourselves. We worked out that at any point of time we had over 1000 devices over the age of 4 years old. That’s a huge amount of potential upgrades. So we developed brochures, organized our inside sales consultant (who manages our procurement division) to run the campaign. This adds a staggering $400K every year in 3 months to our revenue AND it’s win – win – win for Dell, the client and you. The results speak for themselves. We sold more monthly support. We sold more network upgrades. We sold more PC’s. In our first year our Sales Manager increased sales by $1 million and we kept doing it by being efficient in our sales processes NOT by adding more leads. We ended up hitting $7M in revenue and the business is continuing to grow with an average monthly support deal value of only $2K (no whales). I hope these tips have helped and if you feel you need to be a ‘purple cow’ and give your clients a premium customer experience let us know. Feel free to contact us for a demo OR get started on a free trial.